This tutorial provides you with a foundation for working with trimming clips in Adobe Premiere Pro. It is the third lesson in the Adobe Premiere Pro CS5 Digital Classroom book. For more Adobe Premiere Pro training options, visit AGI’s Premiere Pro Classes. You can begin editing clips after you add them to the Timeline. 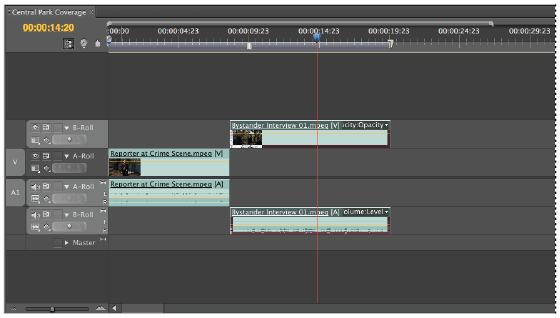 The type of edit you do in the Timeline helps you judge how each clip relates to the other clips in your sequence, thus refining the rough edit you do by trimming clips in the Source Monitor. In this part of the lesson, you will trim the beginning and end of the Bystander Interview 01.mpeg clip to refine the edit. 1 With the pr0301-working.prproj project still open and the Timeline panel active, move the playhead to the 14-second and 20-frame mark (00;00;14;20) on the Timeline. This is a good point in the clip at which to end it because it is a momentary pause in the character’s rant; since he is moving around, this pause point fits with the Cut on Action principle of continuity editing. jump to the 14-second and 20-frame mark on the Timeline. When working on your own projects, we strongly recommend that you play through the Timeline many times to determine the best edit point for your footage. 2 Press the + sign on your keyboard three times to cause the Timeline panel to Zoom In on the current position of the playhead. Notice the small graph on the audio track. This is called a waveform, and it displays the volume of a track over time. The playhead is currently positioned at a level point on the waveform, which represents a point of silence, when the speaker is quiet. This point is usually the best place to cut a clip, because it gives the illusion the speaker is taking a pause and has the most natural affect. When cutting a clip, you must be careful to not cut too closely to where a person is starting or stopping while speaking. 3 Click the – sign on the keyboard three times to return to the Timeline panels previous display and confirm that the Selection tool is the active tool in the Tools panel. Position your cursor at the end of the Bystander Interview 01.mpeg clip. Notice that the selection tool changes to a Trim tool ( ). You can press the V key on your keyboard to activate the Selection tool. 4 Click the end of the clip with the Trim tool and drag it toward the playhead. The cursor snaps to the playhead when it gets close. This trims the Out Point of the clip to match the current position of the playhead. 5 Trim the beginning of the same clip. Move the playhead to the 9-second and 8-frame mark (00;00;09;08) on the Timeline. To move your playhead on the Timeline manually and to move it precisely one frame at a time, press the left and right arrow keys on your keyboard. The Selection tool leaves a space between two segments of a clip, called a gap, when you use it to trim a clip. In the next step you will use a tool that automatically removes gaps as it trims your clips. 6 Click the Ripple Edit tool on the Tools panel to activate it. If the Tools panel is not visible, select Window > Tools. Move the tool to the beginning of the Bystander Interview 01.mpeg clip and click and drag it to the playhead to perform a ripple edit to the clip. The tool appears to not work; in fact, the entire clip moves automatically to the left to remove the gap created by trimming the clip. 7 Press the Home key on your keyboard or manually move the playhead to the beginning of the Timeline, and then press the spacebar to preview the edits in the Program Monitor. 8 The edit point of the reporter cutting to the bystander is still rough; trimming the Reporter at Crime Scene.mpeg clips fixes this. Move the playhead to the 8-second and 3-frame mark (00;00;08;03) on the Timeline. Place the Ripple Edit tool at the end of the Reporter at Crime Scene.mpeg clip and click and drag it toward the playhead. Notice that when you trim the clip, all clips to the right shift to maintain the integrity of your edits. The Ripple edit tool automatically removes gaps that would otherwise be created when trimming clips with the Selection tool. 9 Press the Home key on your keyboard or manually move the playhead to the beginning of the Timeline, and then press the spacebar to preview the edits in the Program Monitor. Notice that at the beginning of the reporter scene, she seems to hesitate before saying the word “The”; you will correct this as explained in the next step. 10 Move the playhead to the 5-frame mark (00;00;00;05) on the Timeline and place the Ripple Edit tool at the beginning of the clip. Click and drag towards the playhead to perform the Ripple Edit. Again move the playhead to the beginning (00;00;00;00) of the Timeline and preview the edits in the Program Monitor by pressing the spacebar on your keyboard. The edits seem more refined. 11 Choose File > Save or press Control + S (Windows) or Command + S (Mac OS) to save these changes to your project. Do not close this file; you will need it in the next part of the lesson.